Rice has been part of the human diet for thousands of years. Historical evidence suggests that rice may have been produced and consumed up to 10,000 years ago. This, alongside its current global status as the world's most important human food, makes rice production responsible for feeding more people over a longer period than any other crop. Into the future, rice will remain an important food staple for billions of people. To help ensure that rice can contribute to the safe and healthy diets of rice consumers worldwide, IRRI has studied the glycemic index of rice and is developing healthier rice. Rice is a source of protein and contains various vitamins, such as thiamin and niacin, and minerals, such as zinc and phosphorus. Some nutrients, including vitamin E, magnesium, potassium, and manganese, are lost during milling and polishing—the process by which brown rice becomes white or polished rice—and are therefore only found in brown rice. Some specialty types of rice, such as those that are purple or red in color, contain more of the pigment anthocyanin, a known antioxidant. Despite these, when eaten on its own, rice (whether white or brown) from existing varieties does not provide enough micronutrients for optimum health. 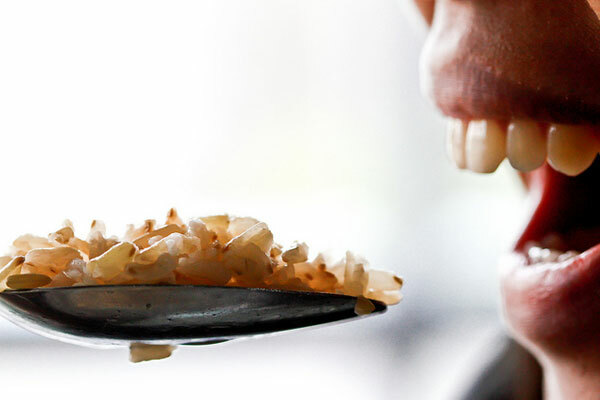 To help improve the nutritional content of rice, IRRI is developing healthier rice that in the future could provide more vitamin A, iron, and zinc to people in rice-consuming countries who currently don't get enough of these nutrients. Rice is also a valuable source of complex carbohydrates, which is the best source of energy. In the past, rice had been generically assessed as a high-glycemic index (GI) food. GI is a measure of the relative ability of carbohydrates in food to raise blood sugar levels after eating. High-GI foods can increase a person's chances of getting diabetes, while low-GI foods are better for health and can help lower the chances of developing diabetes. However, IRRI research has shown that different types of rice have different GIs, ranging from a low of 48 to a high of 92, with an average medium GI of 64. This indicates that rice can be part of a healthy diet for the average consumer and that people who have diabetes or are at risk of developing it can select the right kind of rice to help keep a healthy low-GI diet. Occasionally, there have been health scares around contaminants in rice, such as lead, arsenic, or cadmium. While it is important to test for and minimize the causes of food contamination, the vast majority of rice produced for human consumption has so far not been found to be widely contaminated with any of these. Are we at risk from metal contamination in rice?